Being one of the world’s current top attractions of investments and tourism, Dubai is in a continuous race to meet and exceed its visitors’ ever-changing expectations. A commitment that is clearly reflected in the city’s exclusive features and evolving landscape. However, Dubai is best known for housing Burj Khalifa, the world’s current tallest building with the height of 823 meters; a habit which the city is planning to keep through building Dubai Creek Tower, the world’s next highest building. 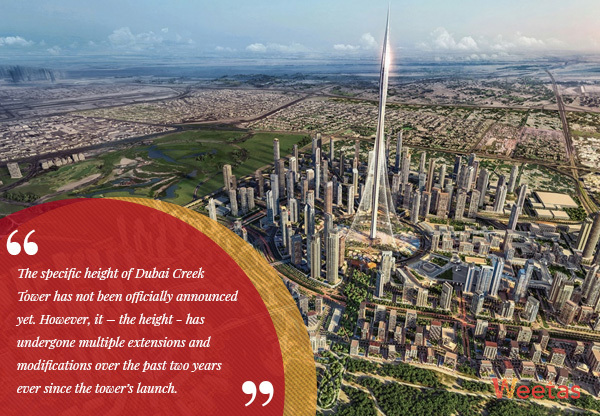 Launched by Sheikh Mohammed bin Rashid Al Maktoum, the ruler of Dubai, in October 2016, Dubai Creek Tower is set for completion in 2020. The world’s future tallest building is located 8 kilometers away from its predecessor, the 823-meter high Burj Khalifa tower; it will be situated at the heart of the eponymous waterfront area of Dubai Creek harbor. 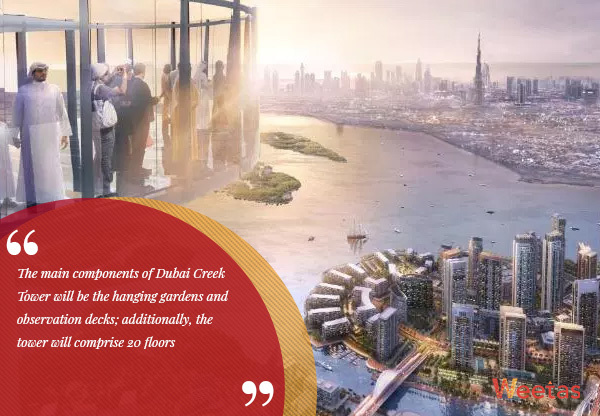 Thus, Dubai Creek Tower will be located within a close distance from Ras El Khour National Wild Life Sanctuary, for which it will offer a mesmerizing view for the visitors. The tower’s location adds to the luxurious state of the harbor, which spans around 6 square kilometers of land. Dubai Creek Harbor is located 15 minutes away from Dubai Downtown; it will comprise multiple high-end attractions that will be the firsts of their kinds. Such destinations include Dubai Square, an ultra-modern retail district that has been revealed recently which will be developed by Emaar Properties and Dubai Holding; it will be the first retail destination to combine online and offline shopping experiences through enabling the customers to choose. The creek will also house luxurious world-class tourism and entertainment attractions like Meraas’s Al Seef which will sprawl 1.8 kilometers along the creek and high-end residential options. Santiago Calatrava, one of the most renowned architectures worldwide and the man executed the tower’s design said that the design’s inspiration came from the shape of the Lily desert flower. Essentially, Dubai Creek Tower resembles a flower’s thin stem. Dubai Creek Tower also has a very striking feature incorporated in its design which is the cable arrays; these arrays do not only add to the outstanding beauty of the tower through their shape which resembles the ribbing of the lily’s leaves, but they will also connect the tower’s structure to anchor points on both sides of the tower to help support and stabilize the 1,000+ meters building. 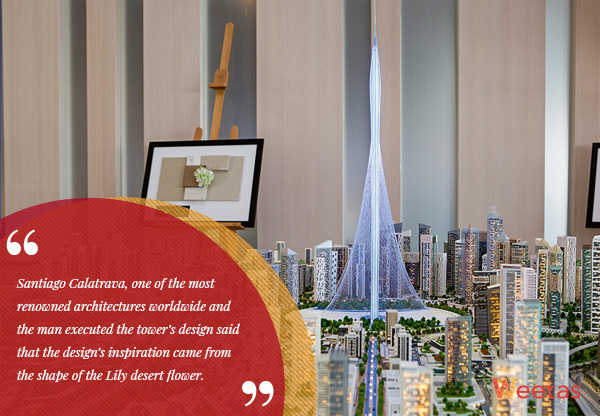 At the peak of the tower, there will be an oval-shaped structure which resembles the lily flower’s bud. This structure will comprise multiple floors in itself that will mostly serve as spectacular 360-degree observation decks; the bud-shaped top will also act as a beacon that will emit radiant light during the night. The tower’s design also incorporates the UAE’s culture and history in it as it represents a minaret. The minaret is a prominent architectural symbol in Islam which is considered an integral component of the mosques’ design. In addition to the above, the interior design of Dubai Creek Tower is heavily inspired by the mythical Hanging Gardens of Babylon, one of the wonders of the old world. 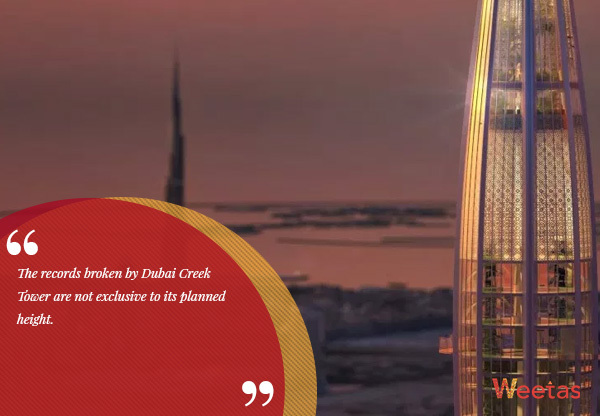 Dubai Creek Tower has an estimated total value of $1bn and it is set to be completed in 2020. Its importance stems from being Dubai’s ambitious attempt to not lose the world’s highest building rank to Jeddah Tower in KSA, which is set for completion within the same timeframe. Additionally, Dubai aims at using the rare chance it will obtain by hosting the highly anticipated Expo Dubai 2020; the event is expected to attract millions of visitors from around the world, which will place the city of Dubai under the world’s spotlight when it takes place. Dubai plans to take advantage of the event to show off its new architectural wonder to the visitors and promote it to the whole world. The specific height of Dubai Creek Tower has not been officially announced yet. However, it – the height – has undergone multiple extensions and modifications over the past two years ever since the tower’s launch. So far, it is known to exceed 1,000 meters at least and it might reach up to 1,300 meters according to some reports. Dubai Creek Tower is not the only tower in the GCC region to seek overcoming the 1 kilometer height barrier; there is a feverish competition in the Arabian Peninsula to house the next tallest structure. Most notable example is Jeddah Tower (also known as the Kingdom Tower). An under-development building in the northern part of the eponymous lively city of Saudi Arabia, Jeddah Tower a planned height of 1,008 meters with its completion date set to be within 2019. Also, there is another 1 kilometer-high tower in Madinat Al Hareer, the promising futuristic city which Kuwait now develops. 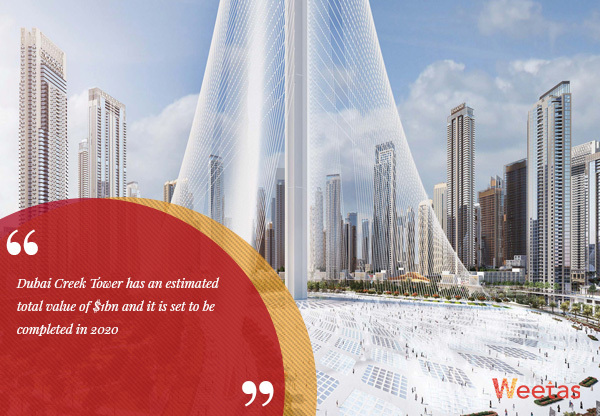 The tower, known as Burj Mubarak, will have the exact height of 1,001 meters. The very specific height of the tower is said to be a tribute to 1,001 Arabian Nights. The main components of Dubai Creek Tower will be the hanging gardens and observation decks; additionally, the tower will comprise 20 floors which will house residential options, luxurious international hotel brands, and high-end office spaces. Also, Dubai Creek Tower will include amenities and facilities to provide the necessary services to the aforementioned units. Such amenities include retail spaces, restaurants, and business facilities. This way, the tower will offer its residents and visitors a fully integrated experience under the same roof. The records broken by Dubai Creek Tower are not exclusive to its planned height. As a matter of fact, the foundation ground works have already set new records, the most remarkable of which being its 235ft deep foundation pile. As we mentioned before, the plan is for the tower to be completed by the date of Dubai Expo 2020. By the end of May 2018, Emaar has completed the pile cap for Dubai Creek Tower before 50,000 cubic meters were poured into it. What is worth mentioning here is that the scheduled completion date for the pile gap was July 2018; the cap has been finished two months ahead of schedule. As Expo 2020 draws near, we are expecting to hear more about Dubai Creek Tower’s features and progress in the upcoming period. 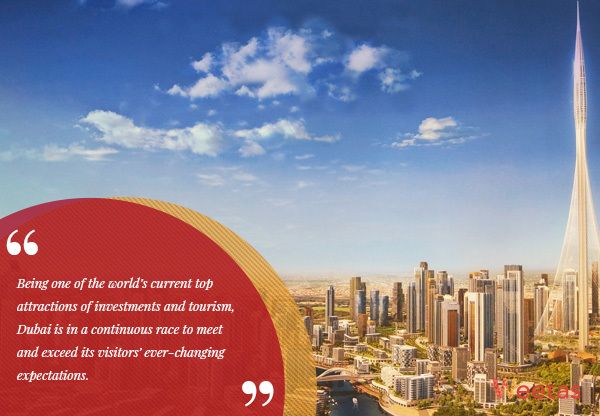 With the ambitious features this project is promising, it is safe to say that its success will help cement Dubai’s position at the top of the list of the world’s best tourism and investment attractions.